The first public demonstration of karate in Japan was in 1917 by Gichin Funakoshi, at the Butoku-den in Kyoto (Hassell 1984). This, and subsequent demonstrations, greatly impressed many Japanese, including the Crown-Prince Hirohito, who was very enthusiastic about the Okinawan art. In 1922, Dr. Jano Kino, founder of the Japanese art of Judo, invited Funakoshi to demonstrate at the famous Kadoka Dojo and to remain in Japan to teach karate. This sponsorship was instrumental in establishing a base for karate in Japan. As an Okinawan "peasant art," karate would have been scorned by the Japanese without the backing of so formidable a martial arts master (Maliszewski, 1992). Shito-ryu was founded by Kenwa Mauna (1889-1952) in 1928 and was influenced directly by both Naha-te and Sheri-te. The name Shinto is constructively derived from the combination of the Japanese characters of MaunaÂ’s teachers' names - Ankh Its and Kanryo Higaonna. Shito-ryu schools use a large number of Kata, about fifty, and is characterized by an emphasis on power in the execution of techniques. considered to be the founder of modern karate. Born in Okinawa, he began to study karate with Yasutsune Azato, one of Okinawa's greatest experts in the art. In 1921 Funakoshi first introduced Karate to Tokyo. In 1936, at nearly 70 years of age, he opened his own training hall. The dojo was called Shotokan after the pen name used by Funakoshi to sign poems written in his youth. Shotokan Karate is characterized by powerful linear techniques and deep strong stances. As its exposure increased, many became interested in Miyagi Chojun Sensei?s art. One of Miyagi Chojun Sense?s senior disciples, Shinzato Sensei, gave a performance of kata at a Japanese martial arts tournament. Afterwards, a master asked the name of his school. Shinzato Sensei had no answer for him, returned to Okinawa and told Miyagi Chojun Sensei about his encounter. In order to promote his art as well as cooperate with other schools of Japanese martial arts, Miyagi Chojun Sensei decided it was necessary to name his art. It became known as ?Goju Ryu? Karate, meaning ?hard and soft? taken from the precepts of traditional Chinese Kempo (see below). He was the first among different schools of karate to name his art and in 1933 his art of Goju Ryu was formally registered at the Butoku-kai, Japanese Martial Arts Association. During the 1930?s, Miyagi Chojun Sensei actively developed and promoted karate-do in Japan and throughout the world. For example, in 1934, a Hawaiian newspaper company invited him to Hawaii in order to introduce and populate karate in Hawaii. In 1936, Miyagi Chojun Sensei spent two months in Shanghai, China, for further study of Chinese martial arts. In 1937, he was awarded a commendation by the Butoku-kai for his kata. Miyagi Chojun Sensei developed Goju Ryu by analyzing and employing scientific methods of exercise. 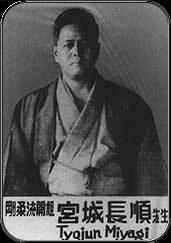 In 1940, he created katas ?Gekisai Dai? ichi? and ?Gekisai Dai? ni? with the purpose of popularizing karate and improving the physical education of young people. He also created ?Tensho? kata emphasizing the softness of the art whereas ?Sanchin? kata emphasizes the hardness. A tragic period ensued in the 1940?s as a result of World War II and Miyagi Chojun Sensei stopped teaching. During this period he lost a son and a senior student while enduring the devastations of war and poverty. After the war, Okinawan karate spread rapidly throughout mainland Japan. Miyagi Chojun Sensei taught karate in Kansai, Japan, for a short time. In 1946, however, he started teaching karate at the Okinawan Police Academy as well as in the backyard of his home in Tsuboya where his son still lives today. From the beginning, Miyagi Chujun Sensei recognized karate as a valuable social treasure of Okinawa. He devoted his entire life to the study, development and transmission of Okinawan karate for the sake of future generations and is truly known as the founder of Goju Ryu karate-do. During his lifetime, Miyagi Chojun Sensei was known and respected by everyone not only in Okinawa but also respected throughout the world as one of karates greatest authorities. 1.The mind is one with heaven and earth. 2.The circulatory rhythm of the body is similar to the cycle of the sun and the moon. 3.The way of inhaling and exhaling is hardness and softness. 4.Act in accordance with time and change. 5.Techniques will occur in the absence of conscious thought. 6.The feet must advance and retreat, separate and meet. 7.The eyes do not miss even the slightest change. 8.The ears listen well in all directions. One doesn’t have to be around a karate dojo very long before hearing this word pass between members. Students and instructors alike will commonly bow to each other upon meeting, or as class is about to begin, and say oss. But what exactly does it mean? character means “to push,” and the second means “to suffer.” Together they symbolize the importance of pushing, striving and persevering while suffering through whatever difficulties, pains and hindrances are encountered along the way. So, at the literal level, oss is simply an affirmation of the positive attitude, high spirits and refusal to quit that all karate people seek to develop as they train. Sometimes students who do not clearly understand the meaning of this word will use it incorrectly. agreement, in the same way that hai (“yes”) or wakarimasu (“I understand”) might be used. Nor should it be shouted out as a kiai word while executing strikes and kicks. Should it be used by parents of students when greeting instructors or students? In practice, anyone who supports the goals of karate and has an interest in learning about it may appropriately greet karateka, if they wish, with a bow and an oss, as a sign of respect and admiration for what they do. Alternatively, the good old smile-and-a handshake are equally acceptable.